Pressure ulcers can develop in as little as a week and have ghastly consequences for both providers and patients. Gel mattress overlays are essential in preventing the onset of pressure ulcers. Read more to find out just how helpful gel mattress overlays can be and if you or your patients qualify. Do you recall the story of Sleeping Beauty, who slept for 100 years? Or Snow White, who fell into a deep sleep until being awakened by a handsome prince? Or better yet, the Princess and the Pea, who was so sensitive to her sleeping arrangements that she was disturbed by a pea, 20 mattresses deep? If only such restorative rest was possible for everyone, not just the characters found in fairy tales. Sadly, for patients at risk of pressure wounds, the bed can turn from a place of respite to a source of great stress and injury. Enter the gel mattress overlay. Sustained pressure. When skin and the underlying tissues experience prolonged contact against a surface such as a wheelchair or a bed, skin cells may be damaged and eventually die. Friction. Friction occurs when skin is dragged across a surface. For instance, when a patient changes position or is moved by a caregiver. Friction is exacerbated when skin is moist. Change positions frequently (e.g. every couple of hours), to put less pressure on the skin. Keep skin clean and dry. After washing, always pat skin dry with a towel. Do not rub. Use pillows between parts of the body that press against each other, for example, under the tailbone, shoulders, heels, and elbows, or, for patients lying on their side, between the knees and the ankles. Exercise. Even for patients who can’t get out of bed, simple exercise and range of motion activities can help reduce the risk of pressure wounds. Gel mattress overlays. 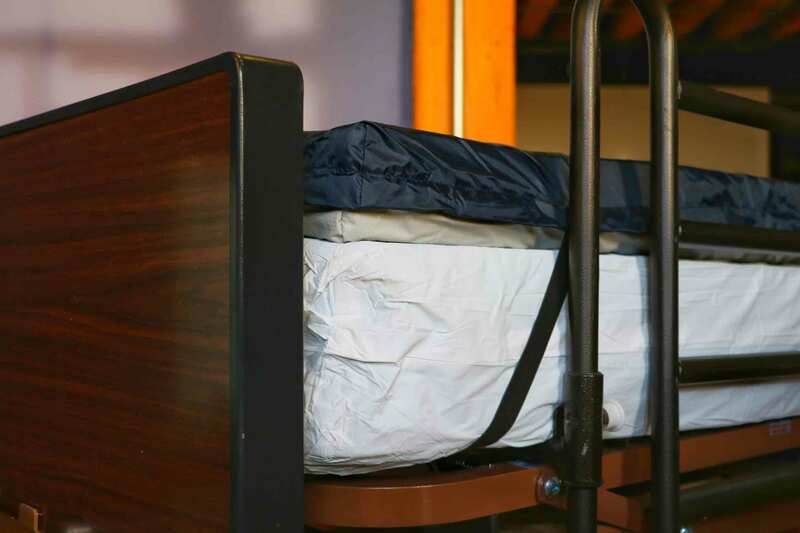 Use a gel mattress overlay to provide an essential barrier between the patient and the bed surface. For many patients, a home hospital bed is a key element on the road to optimal health and wellness; a comfortable bed is essential for a good night’s sleep, and a good night’s sleep provides a foundation that supports all other elements of a treatment plan. When combined with a gel mattress overlay, the benefits of a home hospital bed increase immensely. Gel mattress overlays provide an essential barrier between the patient and the surface against which they're constantly in contact. They distribute weight more evenly to relieve pressure, particularly around areas that lack sufficient padding from muscle or fat, like heels, hips, shoulder blades, elbows, and the tailbone. They have a non-shear, low-friction surface, addressing a common cause of pressure wounds. They also help manage moisture, prevent the growth of bacteria, and are easy to clean. How do I know if my patient needs a home hospital bed or a gel mattress overlay? If you have a patient that fits one or more of the following criteria, then a home hospital bed combined with a gel mattress overlay may be a helpful part of their home care program. They need to be elevated. The patient has a medical condition that requires that their head and upper body be elevated more than 30 degrees. They require frequent changes in position. The patient requires frequent changes in body position either for their condition or to alleviate pain (or both) that cannot be accommodated in a normal bed. The patient requires traction equipment that can only be attached to a hospital bed. Documenting medical necessity for any piece of equipment can be overwhelming, luckily, Wound Care Solutions is well-versed in medical documentation. For more information, check out our guidelines for documenting necessity for home hospital beds and gel mattress overlays. And note that all patients who qualify for a home hospital bed, also qualify for gel mattress overlays for pressure wound prevention. With the help of this equipment, your patients can get a good night’s sleep and avoid the pain of pressure wounds – a happy ending, without the help of Prince Charming or the evil plotting of the Wicked Witch. If you know someone at risk for pressure wounds and would like to learn more about how home hospital beds and gel mattress overlays can help, contact Wound Care Solutions today. We offer a variety of equipment and products to keep patients safe and comfortable on the road back to health.